The second edition of my structures text, Structural Elements for Architects and Builders, has just been published by Common Ground Publishing. More information can be found here. 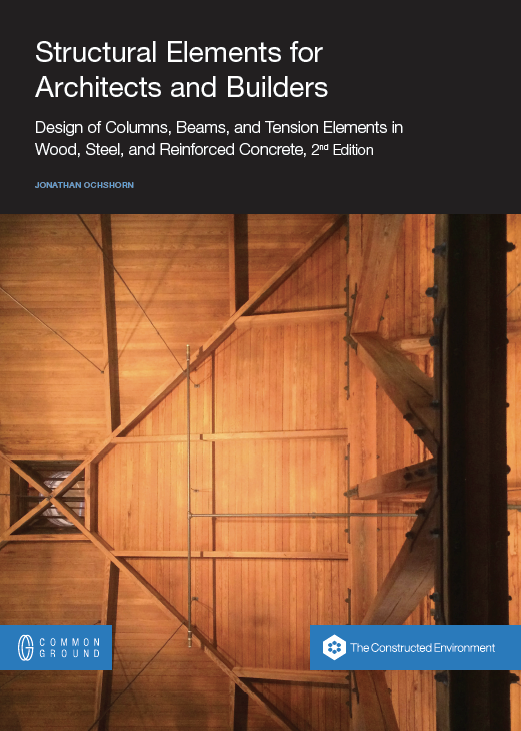 The new edition is substantially different from the first edition, which was published by Elsevier, with reorganized chapters and much new material, including new sections on material properties and systems for wood, steel, and reinforced concrete. The new publishers have a different business model from Elsevier, and are able to offer much lower prices: only $30 for the paperback version and $10 for an electronic (pdf) version. Thanks to Susan Schwartz for the cover photo of Schwartz Auditorium in Rockefeller Hall at Cornell. This entry was posted in Architecture, Writings on August 7, 2015 by jonochshorn.